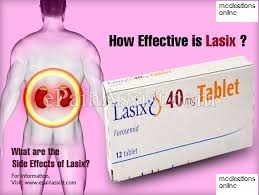 Lasix is a potent "water" pill, used to eliminate excess water and salt retained by the body. Salt, water and other small molecules are filtered through the blood, into the tubules of the kidney, but most of these are reabsorbed in the bloodstream, before being released as urine. 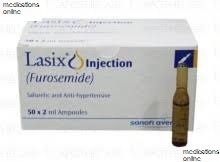 Generic Furosemide blocks this re-absorption, helping the body to get rid of the waste through urine. This diuretic is used in treating edema [fluid retention] in those individuals who suffer from congestive heart failure, hypertension, nephrotic syndrome, cirrhosis of the liver, cerebral/pulmonary edema, severe hypercalcemia, or when they have problems with their lymph nodes. The medicine can be taken by mouth or injected. It takes an hour to take full effect if taken orally. When injected, it takes just 5 minutes for results to peak. The duration of the diuresis normally lasts 6-8 hours. This loop diuretic provides quick relief, but the medicine should be taken for the full term. The pills, available in 3 strengths, may be taken once or twice a day – as prescribed by the doctor, who will decide upon the dose taking the overall medical condition into account. When administered to children, individual weight is also considered while prescribing the dose. Before you take the medication make sure you have informed your healthcare provider about the following conditions, if any: inability to urinate, cirrhosis or any other liver disease; kidney disease, gout, lupus, electrolyte imbalance, high level of cholesterol or triglycerides, sulfa drug allergy, bladder obstruction, enlarged prostate, diabetes, etc. Make sure you have reported a recent MRI or contrast dye injections, which may harm the kidneys. Furosemide can make you urinate more frequently, and there is a chance of fast dehydration, so follow the instructions about the use of enough potassium and salt. Consult your doctor if you miss a dose. It is usually recommended that if you are taking 2 doses every day and miss one, then you can take the missed dose only if 12 hours are still left for the next dose, but don't double your dose, as an overdose may cause dehydration due to excess depletion of water and salts. An allergic reaction such as:- itching, rash, difficulty in breathing, or swelling in the face-lips-tongue-throat means that you should stop the medicine and ask your doctor for help. Overdose symptoms can include: dizziness, fainting, fatigue, confusion, seizures, severe decrease in amount of urine, or coma. US residents can call the US national poison hotline at 1-800-222-1222. If the victim collapses or stops breathing, call local emergency services at 911. After you buy Lasix, store it at a room temperature between 15 C-30 C, safe from heat, light and dampness out of reach of children and pets. Before treatment begins, patients must inform the doctor/pediatrician of their medical history, particularly if there is any pre-existing disease of the kidney/liver/heart, gout, lupus, diabetes, hypertension, anuria, hypercalcemia, or an untreated mineral imbalance. Those who drive or perform risky tasks should try to refrain from such activities, until they know how the medicine affects them and are sure that they can handle it's effects. Alcohol/alcoholic beverages should also be avoided because they can increase the risk of drowsiness, when combined with Lasix. Furosemide may increase your sensitivity to the sun or strong lights, so you should avoid over-exposure to sunlight/strong lights and wear protective clothing when outdoors or facing sun lamps. It is recommended that you do not attempt to treat yourself by taking, increasing, decreasing, or stopping the medicine on your own. Never share your medicine with anyone else, even if they have similar symptoms it can do more harm than good to that person.